SC Wright Group offers its clients access to our secured web-based 24-hour live Project Management Program (PMP). The PMP is our repository for case related photos, documents, field notes, reports, cost of repair, allocation documents and much more. Access to the PMP is free of charge for our clients on the files for which we have been retained. Each client has a unique and secure log-in and password. Once the client is logged on, only case information specific to that client is available. All documents, photos and reports are available for view and can be sorted by address, homeowner, lot, phase, close-of-escrow or allegation just to name a few. Case data is updated directly into the PMP to ensure that our clients have the most current and up-to-date case related data possible. And because the PMP is web based, our clients can review case status anywhere they have access to the internet. Should you wish to see a full presentation of our PMP, please contact our office and we will be happy to schedule a presentation. 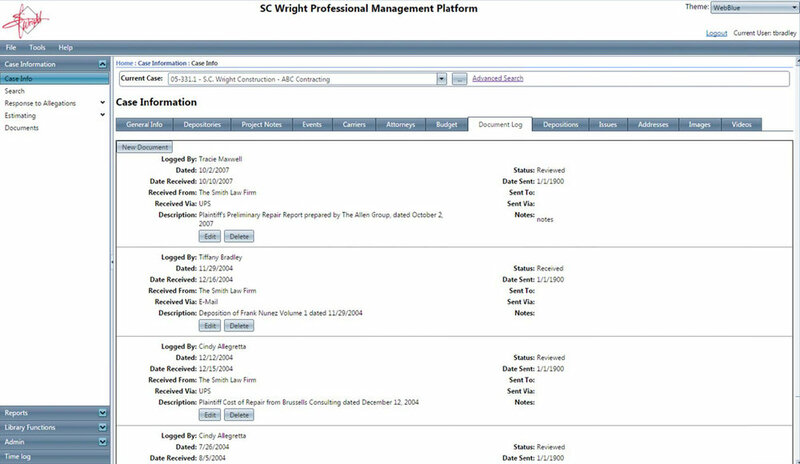 If you already use our PMP and would like to ensure that you are utilizing its full ability, please do not hesitate to contact our office at toll free (877) 839-6909 or email at mail@scwright.com.